I’ve got Joss Naylor to thank for the inspiration. I was flicking through his biography “Joss” and came across a piece about his acute back pain that gnawed away at me all day on Sunday. I suddenly felt pathetic. Reading about Joss and his own severe back troubles made me make some decisions about my own recent shoulder injury. Sod it, I’ll just have to live with the pain. We still had our old van “Max” parked up in the Kentmere valley, after I’d abandoned a planned run over the tops from Ambleside. I checked the mountain forecast for the next day : 70mph gales, wind chill -20’C, white out snow showers. Perfect! Tomorrow afternoon I’d go and fetch it. I changed into my running gear, leaving my poles behind for once. I’ll wait until the soreness in my shoulder has gone before using them again. At the car park on Kirkstone Pass, I had some doubts about what I was planning to do. There were no other cars in the car park. As I stepped outside the wind nearly took the door off our “new” van Patch, so named, as it’s a 5 yr old Citroen Dispatch. It was freezing cold, and hail stung my face. 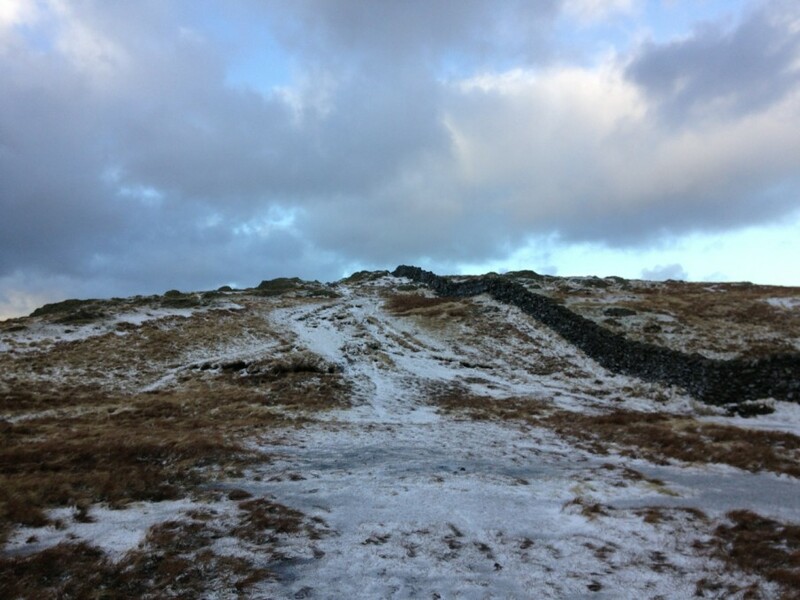 I set off up the climb above the Inn, the ground soaked, some patches white with hailstones. My shoulder was sore but bearable, although I couldn’t push down on my knees, fell runner style. Reaching the ridge brought a change underfoot, with frozen ground and ice. A red deer looked up, startled by my presence, and loped gracefully off. I was enjoying myself. I realised I would much rather be up here with a sore shoulder, in the freezing cold, than back home in a warm living room. The wind was strengthening. With no poles I realised I could run with a map, so stopped to get it out of my bag. I then found I’d already slightly over shot the first summit, Caudale Moor. I doubled back into wind, my first Wainwright summit down in 28mins. 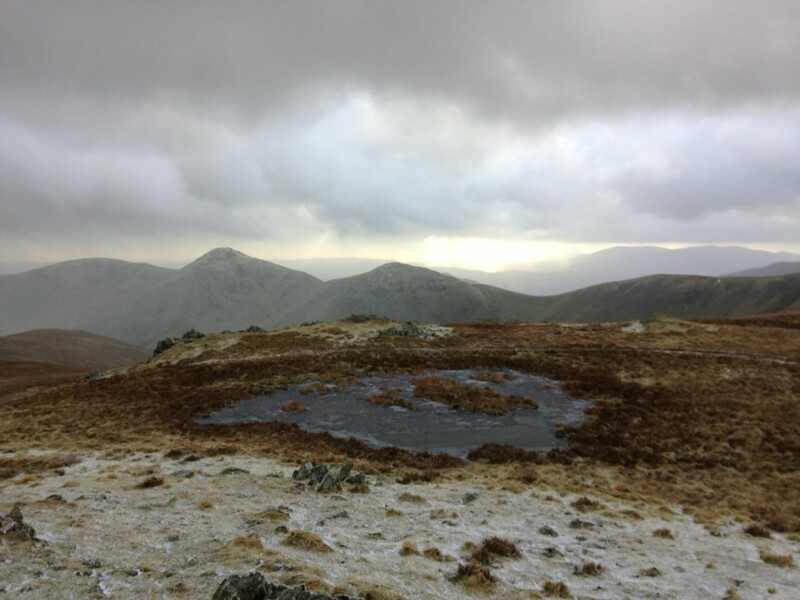 The westerly wind was gale force by the second summit, Hartsop Middle Dodd, reached in 43mins. In the distance, the bulk of Helvellyn loomed white with snow against a backdrop of soot black cloud. I fought against the wind along the ridge before veering into the lee side and shelter. My route took me vertically down the steep, grassy slope, sodden with rain water. I took it very easy, not wanting to slip and fall. In the valley, I waded through the river, then climbed steeply up, past a small stone barn with it’s new corrugated iron roof ripped off on the windward side, a single bent sheet flapping wildly. I had a bit of trouble pulling myself up onto a large boulder to climb the main intake wall. Then it was a steep climb up the ridge itself, back into the strong wind. The path was in the compression zone, the wind too strong for me. I took shelter off the path in the leeward side, putting up with long tussock grass and an awkward camber. 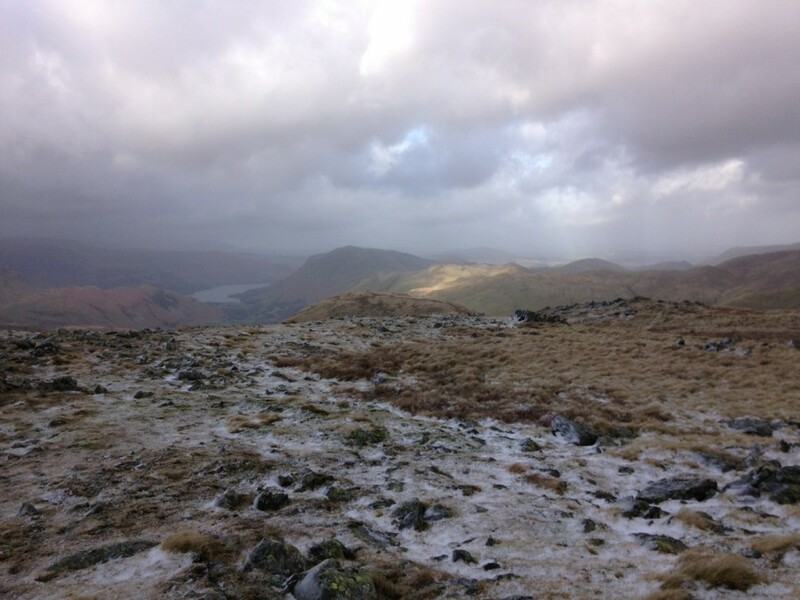 Strangely, the wind was much less on the summit of Gray Crag, my third, reached in 1hr 20mins. A break in the clouds, shafts of sunlight and superb views in the distance to the shining levels of Lake Windermere. I contoured round Thornthwaite Crag. Behind me, dark, menacing looking storm clouds were brewing in the west. I could see big, recent landslides on the steep western slope of High Street. The ground was now frozen again, all the rocks had a veneer of hard black ice. It was impossible to run on the main path. Then it came. I heard it first, and seconds later the gust front nearly bowled me over. Suddenly it was a white out. Hailstones hammering on the left side of my face, buffeting me with ice cold wind. 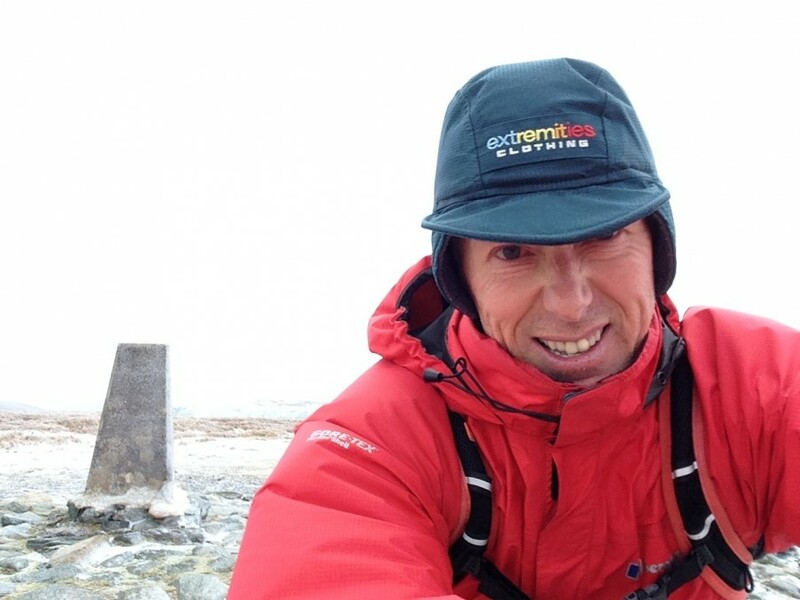 It was a relief to see High Street cairn, my fourth summit, reached in 1hr 59mins. 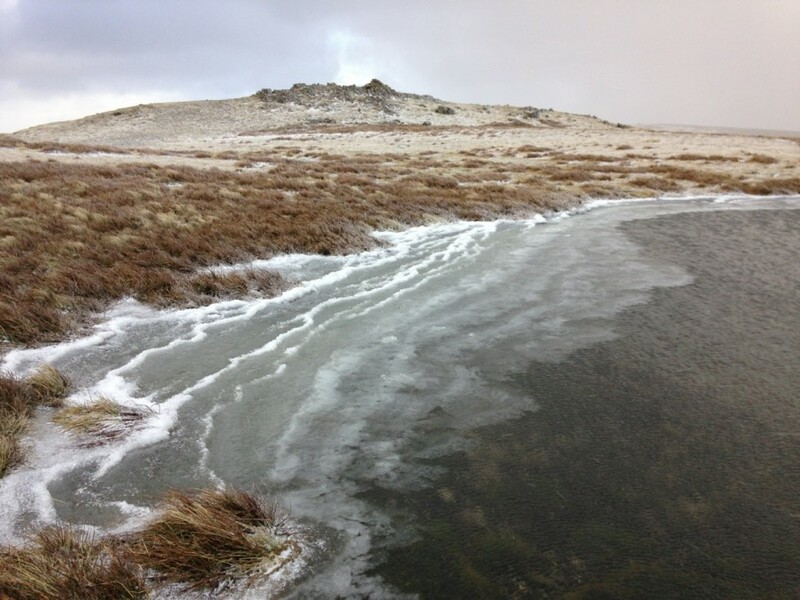 Now the wind was more from behind as I ran down to Mardale Ill Bell, the tarns frozen near the summit. 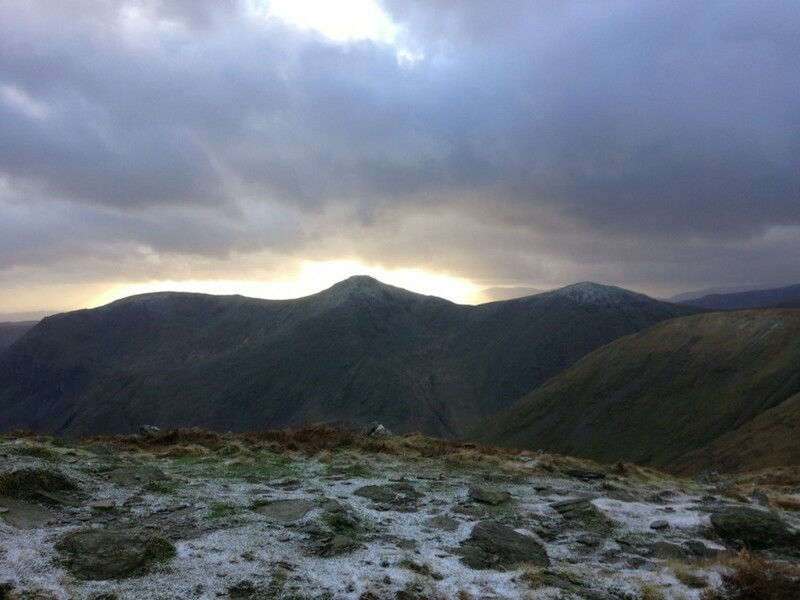 As suddenly as it came, the storm had passed on, and sunshine gave spectacular views towards Ill Bell and Froswick. Another dark storm was coming my way, enveloping Ill Bell. A pair of Ravens wheeled overhead in the turbulence. My fifth summit reached in 2hr 10mins. I had to avoid the treacherous, icy rock down to Nan Bield pass, with hailstones for company again on the climb to Harter Fell. By the time I’d reached this windswept sixth summit, in 2hrs 23mins, the sun was coming out again, and the views all around were spectacular. Now I’m on very familiar territory, my “backyard”. 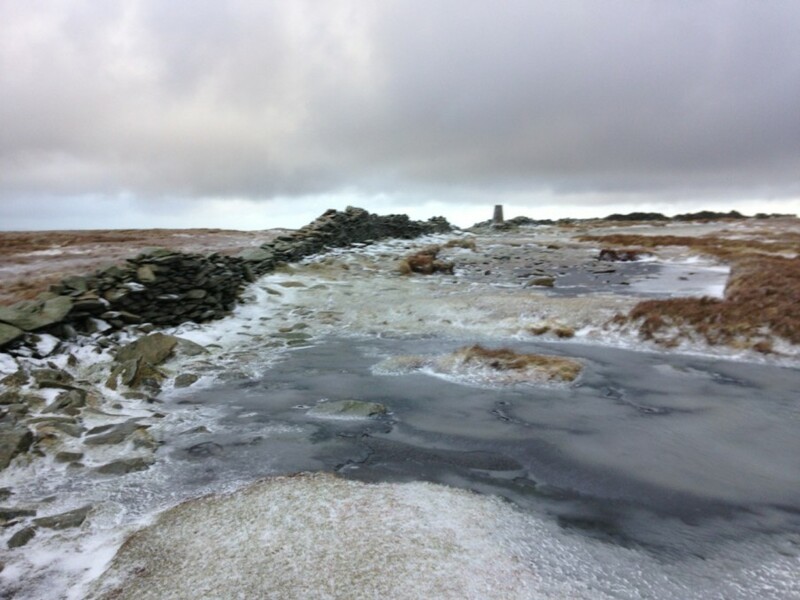 The ground wasn’t quite frozen on the descent to Kentmere Pike, my shoulder painful as I pulled my leg out of a deep peat bog. Another hail shower, then the sun coming out as I climbed the stone wall to the cairn, my seventh summit, in 2hrs 40mins. Downhill now towards Shipman Knotts, another white out hail storm. The final summit, my eighth, in 2hr 59mins. I celebrated by eating one of the two muesli bars I’d brought with me. Tired legs now on the final descent to the valley, running past the church, Kentmere Hall, then along the Kentmere Trail bridleway to the Hollingworth and Vose factory. It was now just going dark. My old van started first time, and I drove the short distance back home to Kendal. 8 Wainwrights today, 194 to go.